Are you looking for a summer treat and a way to get the family involved in the kitchen? I found it or I should say Christy found it, made it, and brought it to school to see what we thought and I loved this recipe. So here they are for you to try with the kids. They will love them! The recipe is right off the box of Nabisco Honey Grahams. 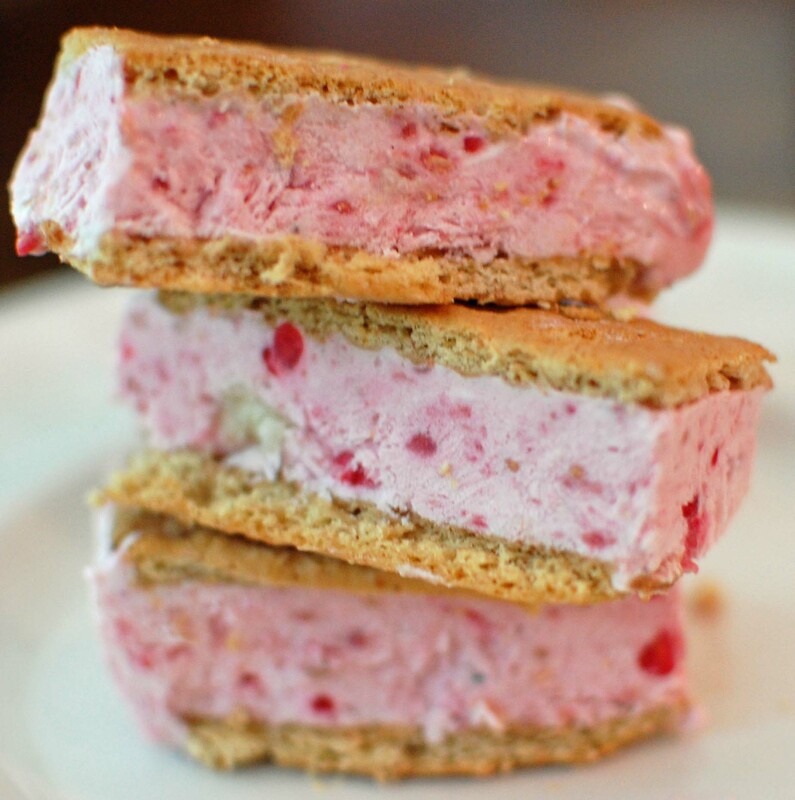 It’s a healthy substitute for ice cream sandwiches since they are made with yogurt and fresh fruit. I used tart raspberries and bananas which really needed a sprinkle of sugar or a dab of honey to add some sweetness. Just to give you a heads up here, the end product is not going to be a nice creamy texture. It’s fruit and yogurt mixed by hand so it will be a little icy. Be sure to let them thaw a good 5 minutes before serving. Very refreshing! Use your imagination. 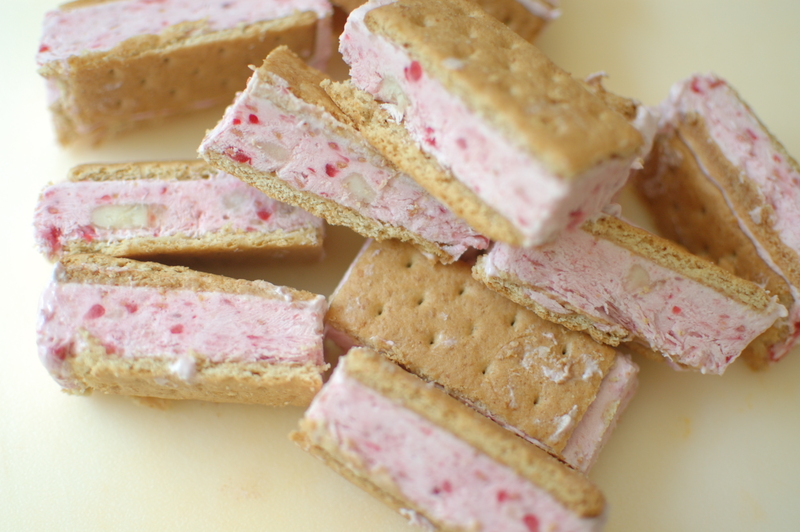 Using chocolate grahams with strawberry and banana would be a fabulous combination. Even better what about some rip Georgia peaches mixed with the creamy yogurt. Choose fruits that your family will enjoy and have fun with it. Enjoy! Here’s how to arrange the bars in the pan. 1 cup of sliced fruit of your choice, strawberries, blueberries, peaches, etc. Line a 9- inch square pan with foil extending over sides. Make sure that you press the foil tightly into the sides. This will ensure that the crackers fit in the pan properly. 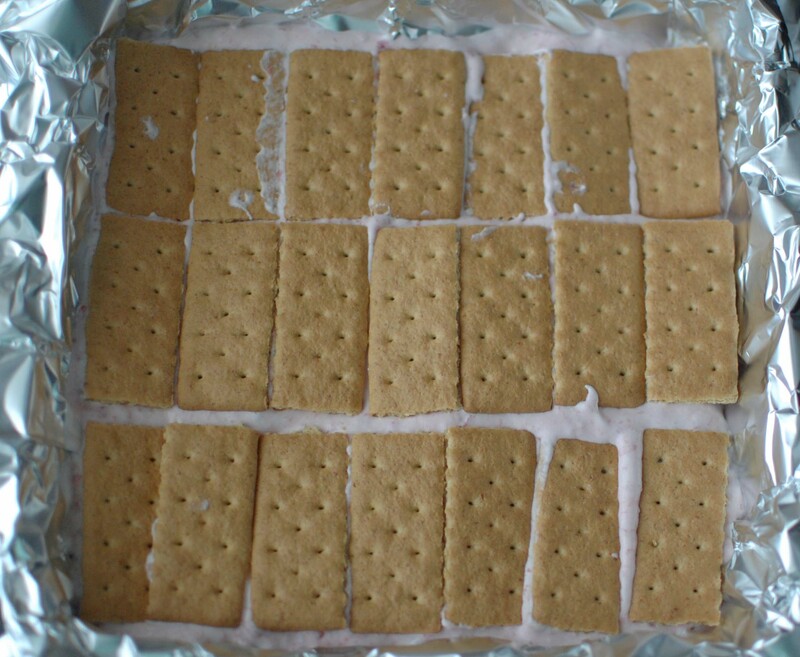 Arrange half the graham cracker in 3 rows of 7 pieces each on the bottom of the pan. Pulse fruit in the blender or use an immersion blender. The fruit should be chunky. Taste your fruit if it seems really tart add a little sugar or honey. Place fruit in a medium bowl with yogurt and whipped topping. Spread the mixture over the graham crackers. Using foil handles lift from pan. Cut between grahams into 21 bars. I found that I had to let the bars stand for about 10 minutes before I could cut them, but they had frozen overnight. Let them stand for 5 minutes before serving. Store leftovers in a ziplock bag in a single layer. I love your yogurt bars look stunning!! These yougurt bars are stunning I love them! i have learned that bananna frozen yougurt bars are very easy to make and dont take that many ingredents to make . I don’t know what a immersion blender is. ive never used tart rasperries. i might have seen them, but nnever heard of the name tart raspberries. I learned that you should extend the foil over the pan and press the foil tightly into the sides to make sure the crackers fit correctly. you have to let them stand 5 mintues before serving them. I learned to add honey or sugar for sweetness. Using a littel bit of honey and some sugar can help with sweetness. And Frozen yourgurt made by hand will never be as creamy as ice cream because of of making of the yourgurt. Whcich is what I learned . I learned that its healty and you use chocolate grahams. You can add sugar to make tart raspberries sweet. You put real chunky fruit peices instead of just yogurt. thanks mrs.lupo i would of used some fatty yougurt i found at walmart for sell & not nonfat greek-style vanilla. thaks mrs.lupo! I learned that adding honey to the treat would make it sweeter. i learned its a easy, quick , healthy snack to make! I learned that it is a healthy substitute for ice-cream sandwiches. I learned that using chocolate grahams with strawberry and banana would be a great combination. you need to let them cool for 5 minutes. I learned that banana-berry frozen yogurt bars are an easy on-bake treat to make. i learned that you can add honey to make something sweeter. I didn’t know that you could make frozen yogurt at home and that it would have an icy finish instead of creamy. i didn’t know u could add sugar to take way from the tartness. I learned that by mixing yogurt and whipped topping you can make a nice creamy desert. I learned that you have freeze for 4 hours. Learned that you have to let the bars stand a few mintues before you cut. I learned that frozen yogurt is more icy than ice cream, whereas ice cream is more of a creamy texture. I guess that’s why they call it ice CREAM.